Virtus.Pro (VP) are coming into the three-day Winter Clash melee sponsored by Megafon and facing their Kuala Lumpur Major nemesis from Team.Secret in the opening game. Who will win? Playing on home turf, VP have been on a roll, keeping their win rate at about 70% in their past 10 games. A much contested-game versus Secret finally fetched them the first Major Title for the 2018/2019 season, and VP are nowhere losing that momentum, especially against Secret. The Kuala Lumpur showed us that the teams played a balanced game, but looking further back in the history of the teams, we can’t help but notice that VP have won 5 out of the 10 games on record. Two have been draws and we saw Secret win only three times. Both squads are fielding their full rosters, with RAMZES666 carrying for VP and Nisha assuming the position for Secret. RAMZES666 has demonstrated a heighten ability to play alongside his team members, and it has so far paid off. We saw amazing play outs by Nisha in nearly every game of the Kuala Major, too, with the Polish player shutting down all opposition. Even if RAMZES666 has been performing slightly better, we sill think Nisha is not to be underestimated. As to the mid-laners, that’s another fairly balanced match, but if pressed, we must give VP’s mid-laner NoOne an edge. He managed to outcreep MidOne in every game of the Kuala Major, even if only by several units each game. This game will be a tough call, too, but VP have gone largely undefeated. Most bookmakers estimate that VP is slightly less likely to win at 1.93 while Team.Secret are given 1.84. This is a close gap. Secret have every reason to want and get back on VP, but we feel that the Russian powerhouse won’t lose on their home turf. Looking for a paying bet? 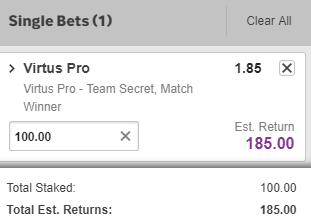 Back Virtus Pro at Betway where the odds are equal and thus VP gets 1.85. Betting tip / Prediction: Virtus Pro wins the match. If you’re new to betting, check our guide on how to bet on Dota 2, what strategies to use and what bookmakers give the best bonuses for your first deposit.